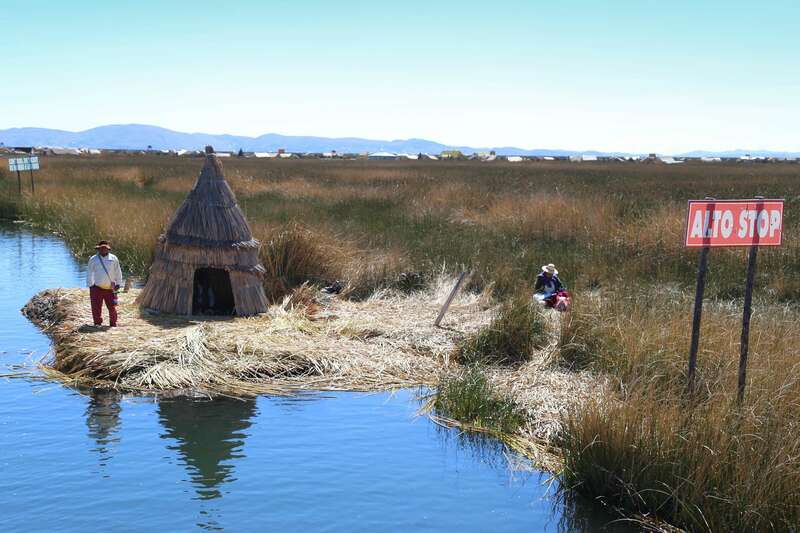 The Uros people have been living for centuries on floating islands built entirely out of reeds. 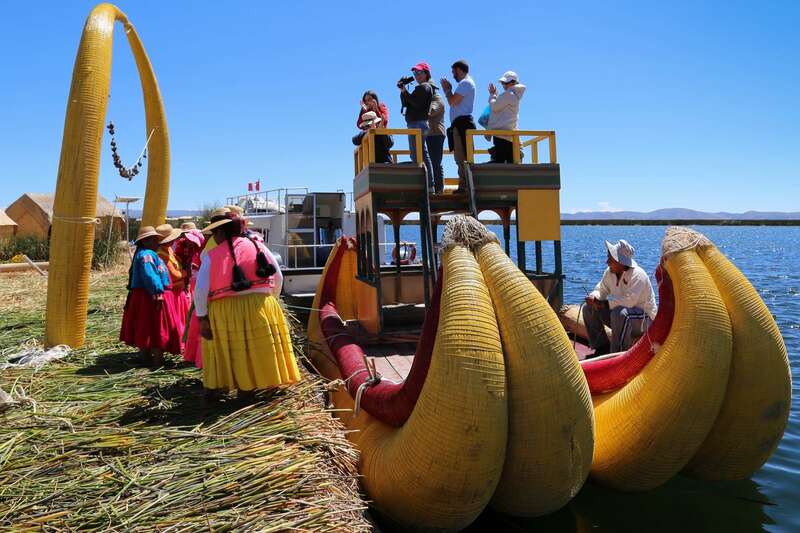 Tour boats make their way from Puno, Peru and travel enroute to the floating islands where the Uros live. 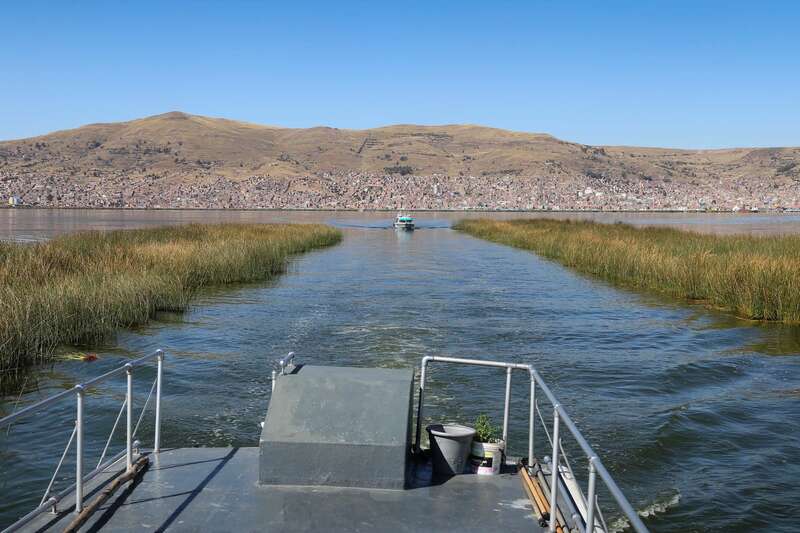 A floating traffic control station keeps tabs on the boats visiting the floating islands of Lake Titicaca. 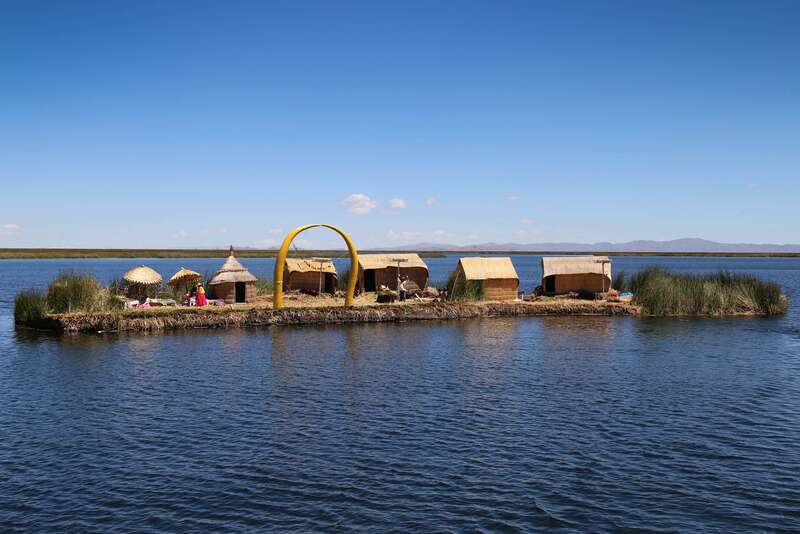 These floating islands are clustered in an area of Lake Titicaca in Peru. 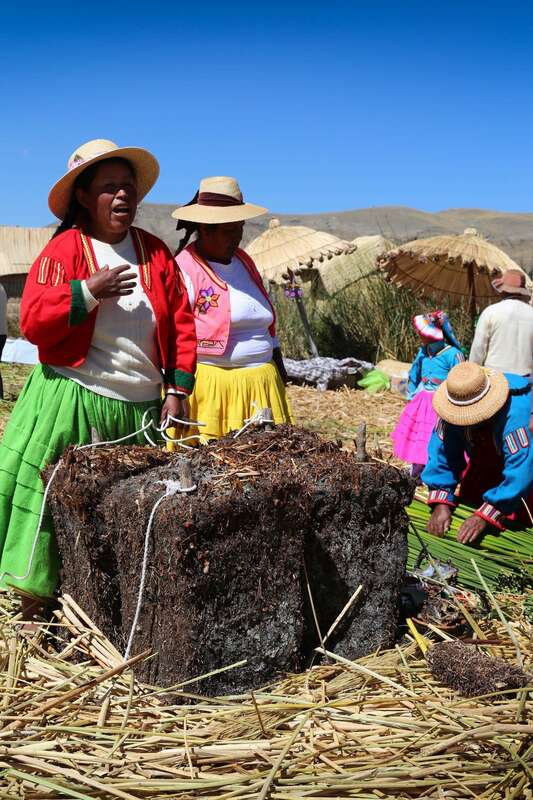 When the Incas were ascendant 1,500 years ago it could have been life or death for the Uros. Their choices were stark: be subsumed by the Incas, fight and face extinction, flee the rich bounty of Lake Titicaca, or perhaps come up with another answer. 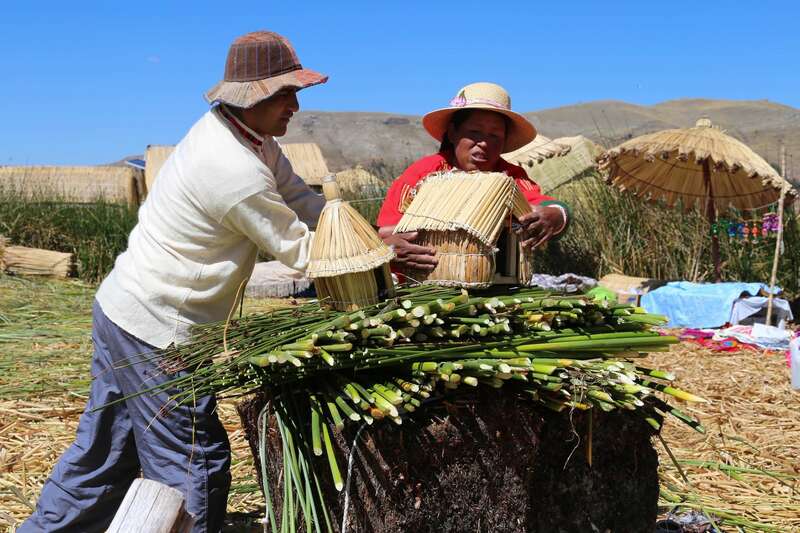 Their ingenious solution – build floating islands using the plentiful totora reeds of the lake – became the answer that has defined a way of life for centuries. Their mastery of the water kept the land-based Incas at bay. Long poles anchor the islands to the bottom of the lake bed. And when modern times threatened their future the Uros once again adapted. The new threat was the pressure of globe-trotting tourists. 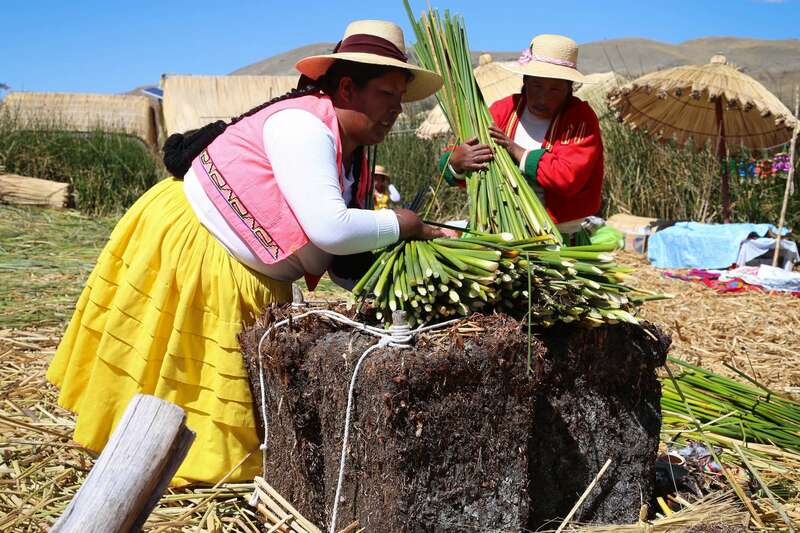 The Uros did not reject them but instead recognized a source of revenue that has allowed them to persevere. Totora reeds are plentiful and easily harvested as a building material and food. Small boats are loaded full with totora reeds that will be taken back to an island to replenish it and keep it afloat. 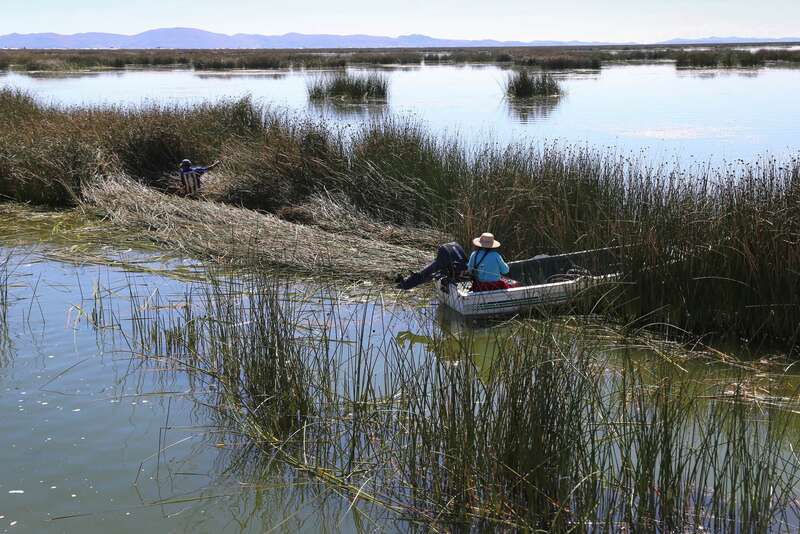 A group of visitors board a reed-built boat for a short jaunt on Lake Titicaca. The basic design to make a floating island, anchored to the bottom of the lake with long poles, is relatively simple. 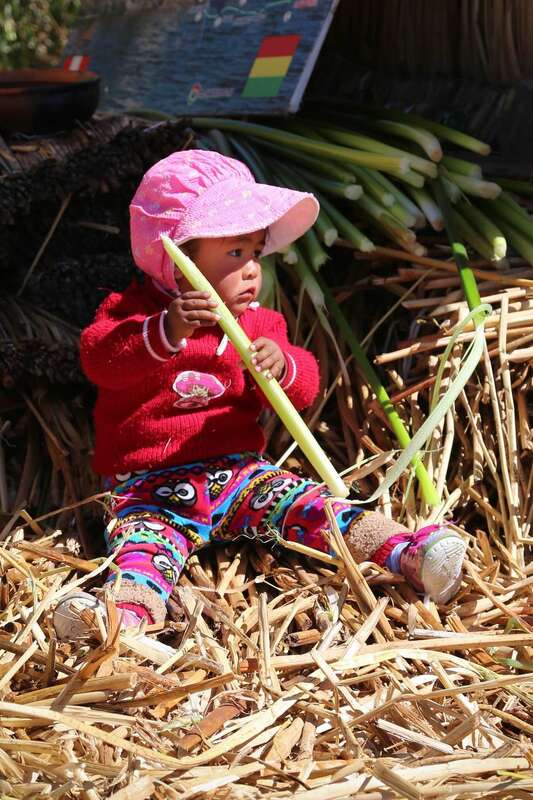 First, harvest totora reeds that grow around the shallower parts of Lake Titicaca. Dry them to reduce moisture and increase their load bearing strength. And finally, pile lots of totora roots on the surface to keep the island above water and the surface dry. Adjust the buildings as needed (also made of totora reeds). Within a week to a few months, the process must be repeated to keep the island from sinking into the lake. The depth of the island must be at least six feet to keep it above the water and to support people and buildings. And a properly constructed and maintained island can last 30 years or more. Above the water dried totora reeds provide a cushion to walk on. 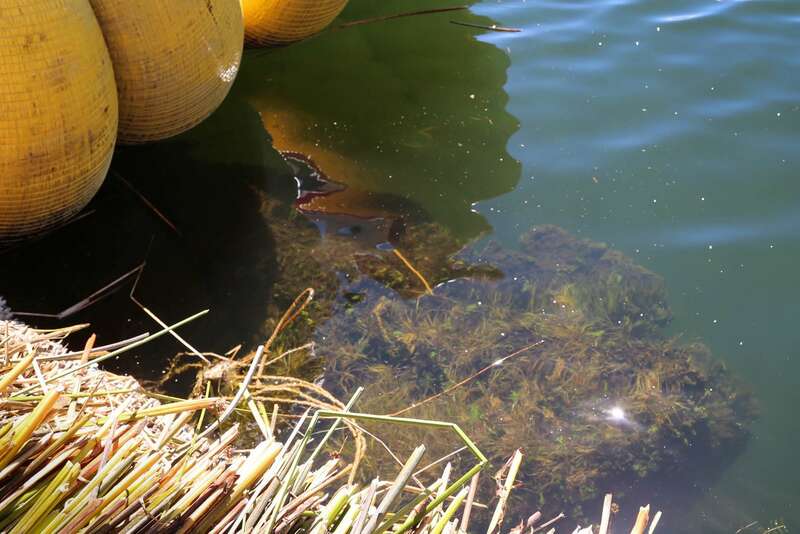 Below the waterline, the reeds slowly decompose. 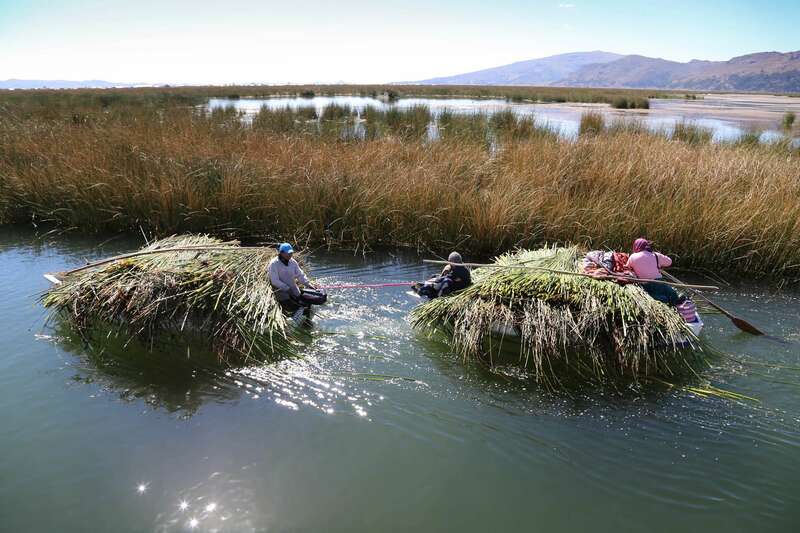 Various articles suggest the number of floating islands on Lake Titicaca is anywhere from 40 to as many as 70. But what is clear, this is a way of life that is not easy. A small cluster of people can live and work on an island as small as this one. The leader of this island is a crack shot and though she has a pleasant smile, she’s clearly in charge. Her husband, right, is happy with the arrangement. Lake Titicaca holds a number of distinctions –named a UNESCO World Heritage Site in 2005, it is South America’s largest freshwater lake, one of earth’s oldest lakes, and the highest navigable lake in the world. 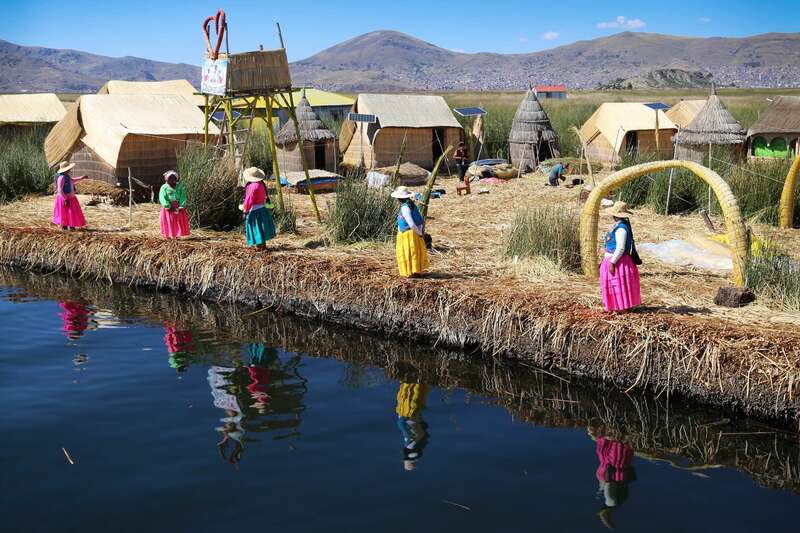 But for the Uros, the lake offered food and game, a reliable source of fresh water, and a comfortable place to live that goes back as far as 3,700 years, according to researchers. In addition to using the totora reeds as a building material, they can also be eaten. The woman in red is clearly in charge of this island; other islands have men who are the leaders of the family. 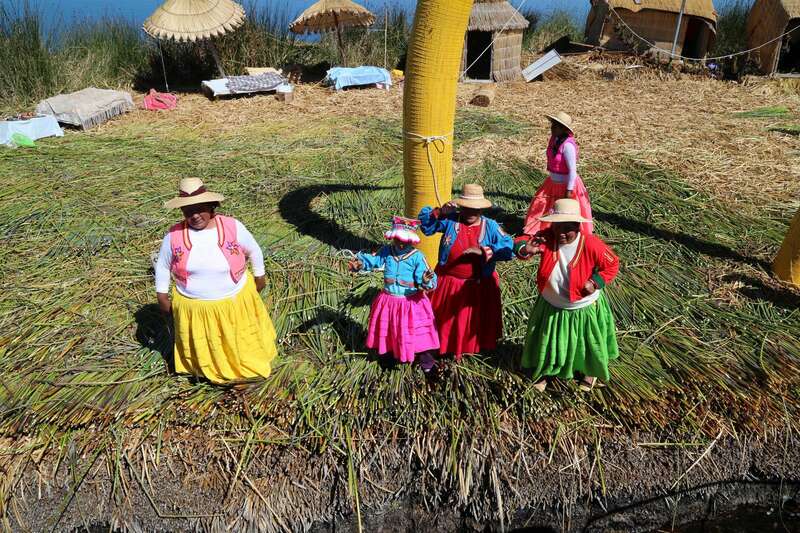 To rebuild their island, dried totora reeds are piled on top, as shown in this demonstration. Once a sufficient layer of reeds have been added, buildings are adjusted to be even with the new height. Even the boats the Uros use to get around in can be made out of reeds, though many use small wooden boats with motors. The body of water is approximately 118 miles long and up to 50 miles wide. 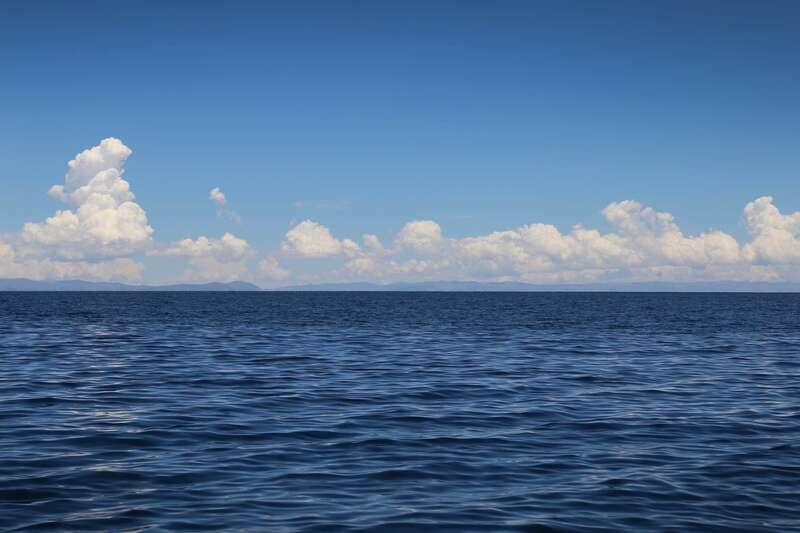 Lake Titicaca has an average depth of 351 feet and at its deepest, more than 900 feet with a total surface area of more than 3,200 square miles. Lake Titicaca sits at an elevation over 12,500 feet above sea level. But the lake is under pressure. Rivers feeding it are being used more and more for agriculture and mining. Climate change has reduced rainfall, and the growing population has increased the need for fresh water. Pollution levels are worsening, as cities around the lake do not always have adequate wastewater treatment capabilities. 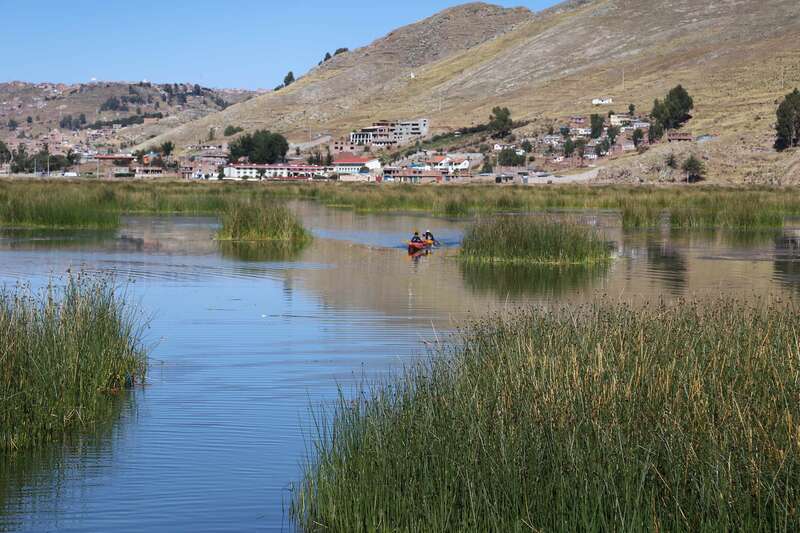 Towns and villages are dotted all along Lake Titicaca. Puno, Peru, the largest city, has a population of over 140,000. The lake borders Peru and Bolivia, creating some interesting dynamics. For example, sales tax for goods are lower in Bolivia than Peru, so the waterway offers smugglers a route to ferry lower-priced goods over to Peru (electronics are popular). And the Peruvians insist the fish caught in their part of the lake is much better than fish caught on the Bolivian side. It’s not hard to guess what Bolivians say about the fish caught in Peruvian waters. Across the waters of Lake Titicaca the snow-capped mountains of Bolivia loom in the distance. 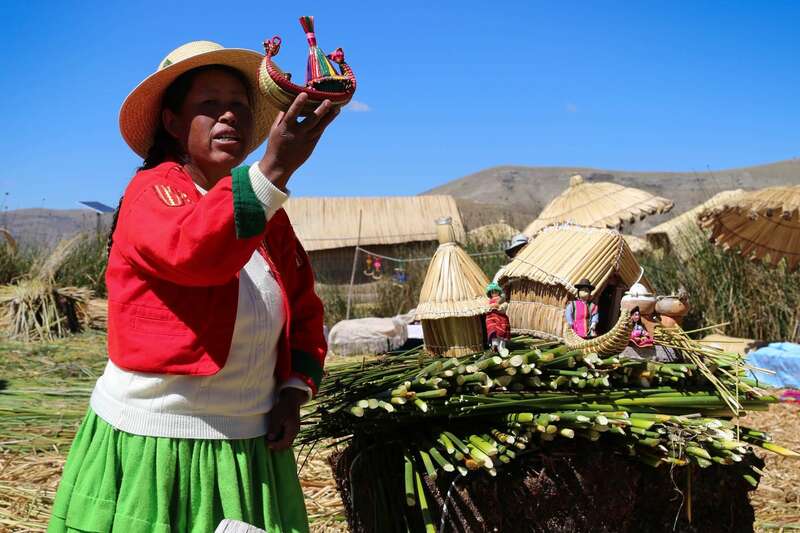 The Uros have settled into a comfortable and cooperative way of life that sustains tourism and enables as many Uros as possible to earn a living. Quite simply, they alternate when a particular island is open to accept tourists on a given day. If you’re open today, you’re closed tomorrow. 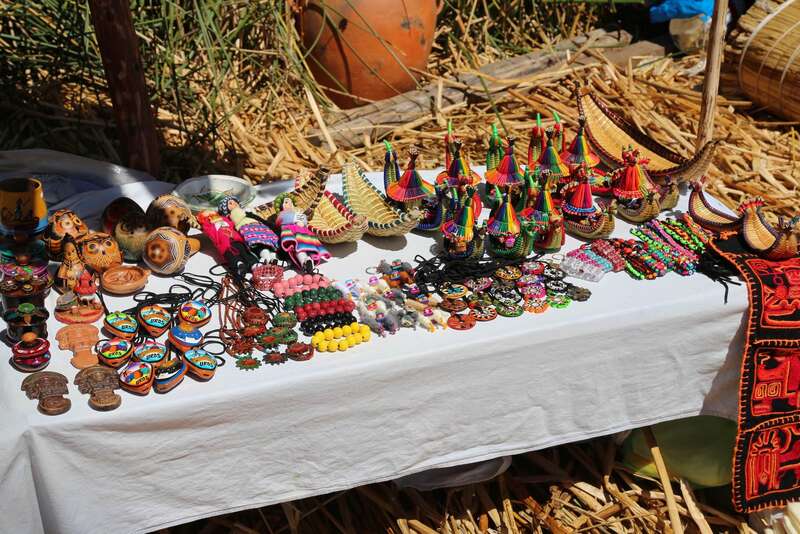 Handicrafts and trinkets are a steady source of revenue that tourists happily snap up when they visit a floating island. 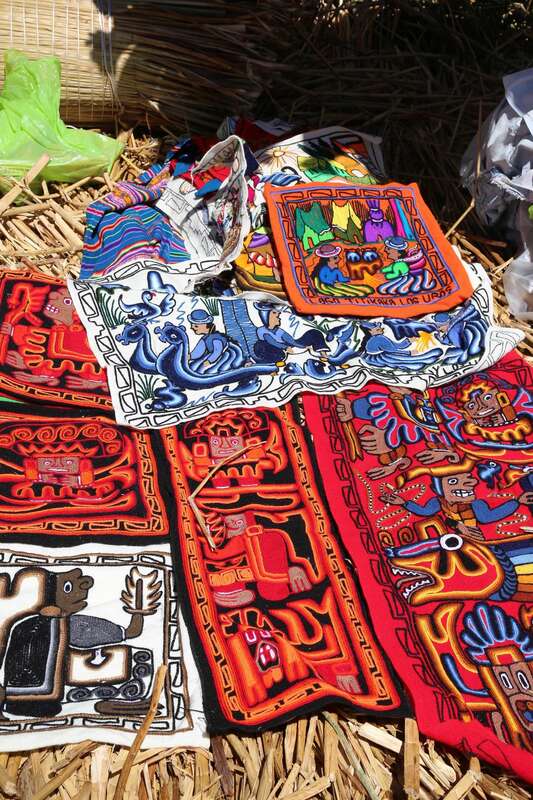 A sampling of weaving and textile goods for sale. While there is a school for young children, a church or two and some other businesses, life is bare bones and simple. There is no healthcare and clothes and other goods must be brought in. Only in the past few years has the Peruvian government begun to install small solar panels on the islands to provide electricity to those who live on an island full time. 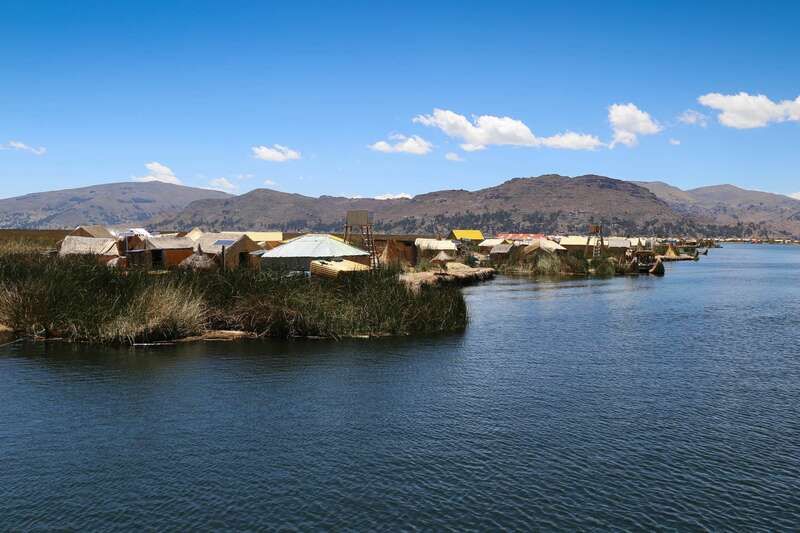 As a consequence many of the Uros live in town, most in Puno, the largest Peruvian city (approximately 140,000 residents) on Lake Titicaca. When they are in town the Uros wear modern-day clothes, but when they go to ‘work’ they dress in traditional garb for the benefit of tourists. Visitors are greeted by residents in brightly-colored traditional dress. Tourist boats rotate which islands they visit in order to give all the residents a chance to earn money. Puno, Peru is in the background. A visit to an island only lasts a half-hour or so. 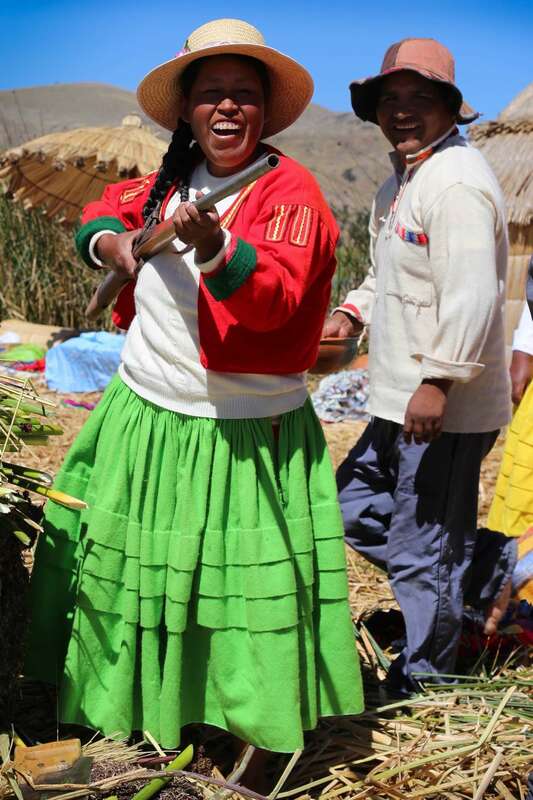 The cheerful residents demonstrate how they make their island, they offer a look inside their sparse living quarters and visitors have a chance to dress up in traditional garb for pictures. Much of the villagers’ income derives from sale of handcrafts and tips that visitors and photographers offer up. One or two islands have a place where the adventurous tourist can spend a night on an island. A visit to an island is short, less than an hour, but long enough to appreciate the challenges of life on a floating island. But living on the floating islands is slowly losing its allure and a way of life is evolving into a business. Work there is hard, and for younger people, there is little or nothing in the way of excitement or entertainment. 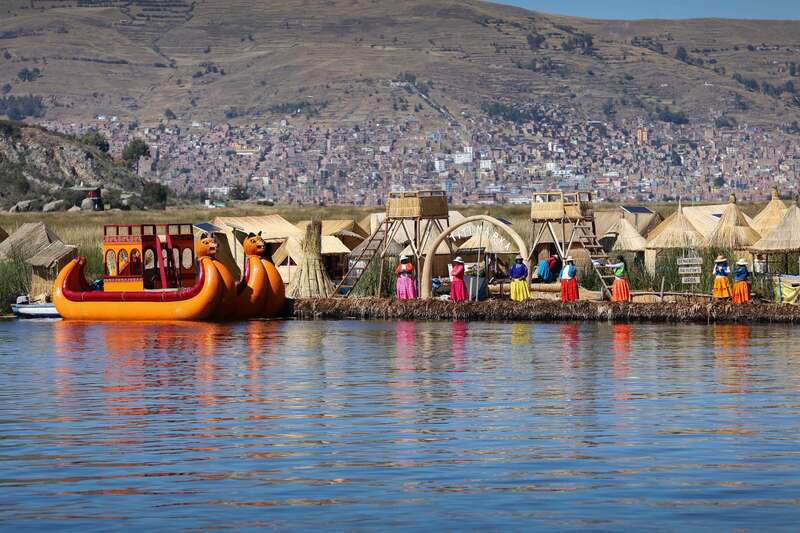 Given that many Uros live in town, city life has an increasing pull over a floating island. This baby sits patiently while the parents entertain visitors. Once the child is grown, will she choose life on the island? 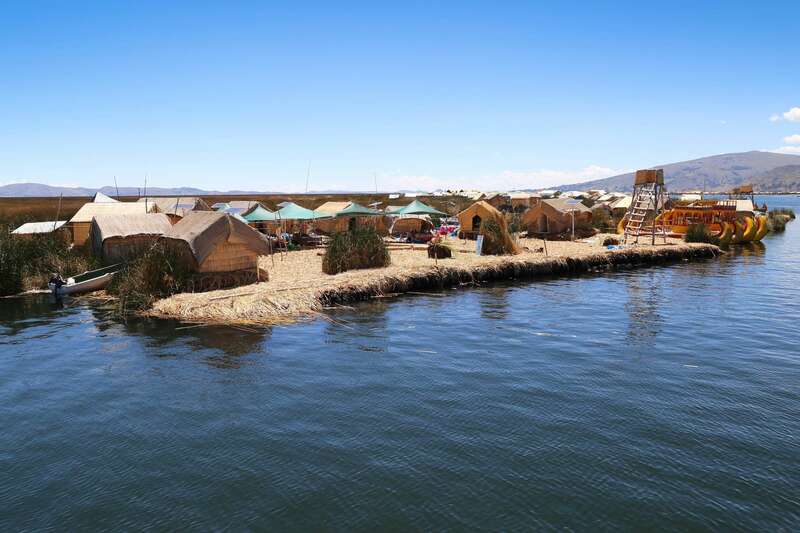 No doubt the floating islands of Lake Titicaca will be around for many years to come and a trip there offers visitors a rare glimpse at a way of life that came about when a small group of people were faced with a difficult choice. 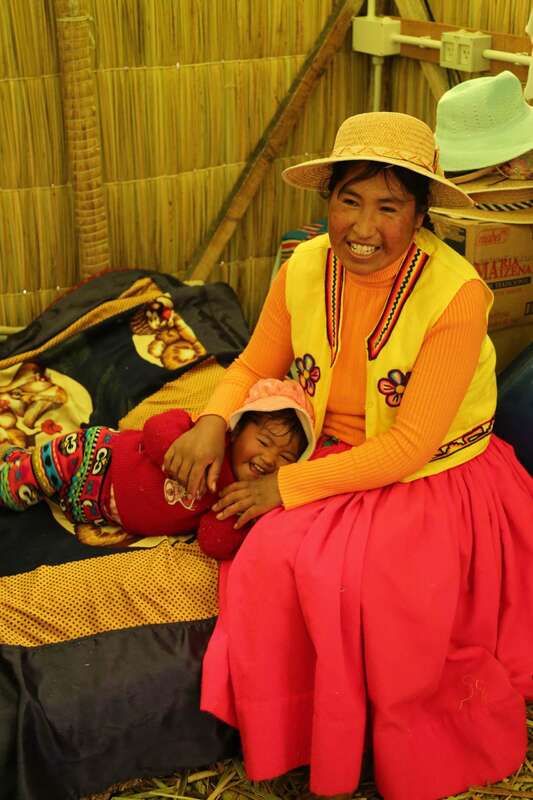 The inside of a hut on a floating island is sparse, but mother and child seem happy. The wall plugs in the background are solar powered. 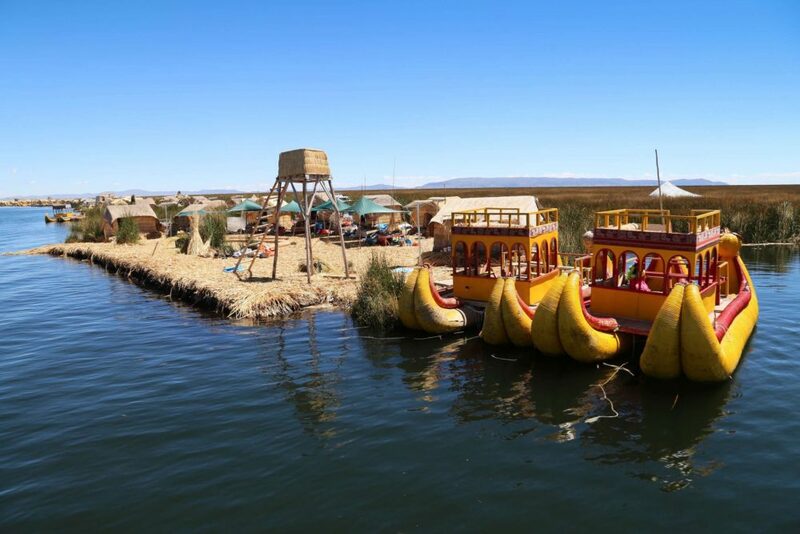 This entry was tagged A City A Month, floating islands, Lake Titicaca, Michael Kardos, Titcaca, travel, Uros. Bookmark the permalink.